Many fans of baseball history know that Ty Cobb became a very wealthy man not on the strength of his demonic hall-of-fame career but rather by investing heavily in a new company called Coca-Cola. 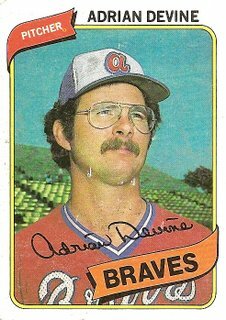 In that light, the Ty Cobb of the 1970s was Adrian Devine, shown here in a 1980 photograph evincing smug confidence in his recent acquisition of a majority share of stocks in Let It Breathe, Inc., which as everyone now knows is the world-famous corporation concentrating solely on manufacturing products made of mesh. Devine rounded out his prudent investment portfolio by purchasing several of the now-ubiquitous Aviator Glasses “R” Us franchises. You are currently browsing the archives for the Adrian Devine category.